"Cheap Thrills" is a song recorded by Australian recording artist Sia for her seventh studio album, This Is Acting. It was written by Sia and Greg Kurstin, while solely produced by Kurstin. An official remix version of "Cheap Thrills" features vocals by Jamaican performer Sean Paul and was made available for digital download on 11 February 2016 as the record's second single. This version was nominated for the Grammy Award for Best Pop Duo/Group Performance. The song is a "bouncy", "reggae-tinged" synthpop song that incorporates "a constant tropical beat and electropop-style synth layers". Paul added his own lyrics to the remix of the song. The Grammy award winning Dance Pop song "Toxic", originally sung by Britney Spears has been called the one song moviegoers will be humming on their way out of Pitch Perfect 3. In this exciting arrangement for the Bellas, the strings and guitar lines from the original are all covered by the vocals. This is an impressive offering for the women in your program. "Sit Still, Look Pretty" - Originally released by teen pop sensation Daya and then re-energized in the movie Pitch Perfect 3, this is a song of empowerment for girls and women. In her own words, Daya states that this is a song about a girl that goes after her own dreams and really fights for what she wants. 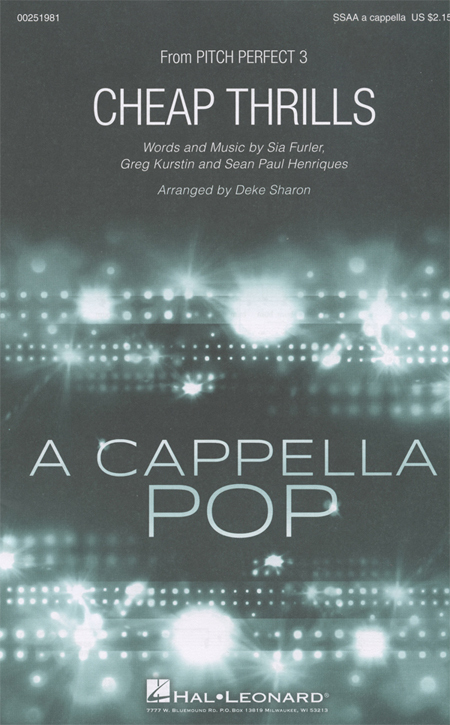 All of these good vibes wrapped up in a dynamite pop a cappella arrangement. "Cheap Thrills" - In Pitch Perfect 3, the Bellas are all grown up but not having much luck finding work as musicians. This up beat song reminds them and all of us that you don't need money to have a good time. Making music and dancing are the best remedies for fun. That message will resonate with your singers and your audiences. In Pitch Perfect 3, the Bellas are all grown up but not having much luck finding work as musicians. This up beat song reminds them and all of us that you don't need money to have a good time. Making music and dancing are the best remedies for fun. That message will resonate with your singers and your audiences.